Allison is the perfect example of women empowerment. Her journey inrspired by so many people in the community especially the students of PepUp Tech. Let’s know more about her, challenges she faced and aspirations in her own words. Below is the Q&A I had with Allison that motivated me. I hope it’ll have a similar effect on everyone who’ll read too. When I graduated from college, I thought I wanted to be in Sales and Marketing. I believed that this was the best chance to share my creativity in a business setting. I got a job working Sales and Marketing support for a small company. I had a great deal of fun figuring out how to make the business processes more efficient and setting up the systems to support those processes. After getting promoted to as a Sales position, I realized how much I missed working with systems. When there was an opening for a programmer in the company’s IT department, I jumped on it. I learned to program on the fly. I was surprised to learn that programming is an ideal opportunity to be creative and create efficient processes. I worked in Information Technology as a programmer for about ten years before I moved full-time into IT leadership. While running the IT department for a mid-sized manufacturer, the Sales department asked that we find them a Customer Relationship Management (CRM) system. It was then that Salesforce came to my attention. I started with a Quick Start package that had me set up the entire environment. I was absolutely “smitten” with this new system. Right out of the box, I had a full CRM. The investment of time and knowledge began with setting Salesforce up to meet the unique business requirements. I got the chance to attend my first Dreamforce in 2011 less than a year after implementing Salesforce. It was there I learned more about the Platform and I was completely hooked. I wanted to learn more about technology AND the community. I am empowered when I am in Salesforce. I can create and mold a seemingly infinite number of applications. All of it is accessible from any internet browser around the globe. How cool is that?!!!! Because Salesforce offers free training and a supportive community, there is no better place or time to start your Salesforce journey. There are Girl Develop It classes, Community-led BAM events, and even Student Community Groups forming at colleges. When I was in college, I never dreamed I would have a career in IT. I couldn’t picture myself in my career. However, years later, I realize that I never understood how creative and fulfilling it would be to use technology to solve business problems. I am committed to helping young women discover Salesforce and think seriously about seeing how empowering it is to manage and understand technology. Like most of us, every day I think I don’t know enough or am not strong enough in a particular topic or skill set. I battle Impostor Syndrome to believe that I really can master new skills and continue to perform at a higher and higher level. But as my good friend, Rachel Park, has said, I let that fuel my desire to learn more and take a chance at trying new approaches. I am inspired by so many people in the community especially the students of PepUp Tech. To see how the joy of this technology and the doors of opportunity which have opened to change their lives, is truly humbling. It inspires me to find new ways to share what I learn with the community and support each other, not just in Salesforce, but in life. Being named an MVP earlier this year was really a surprise gift. The work I do in the community is really a labor of love. 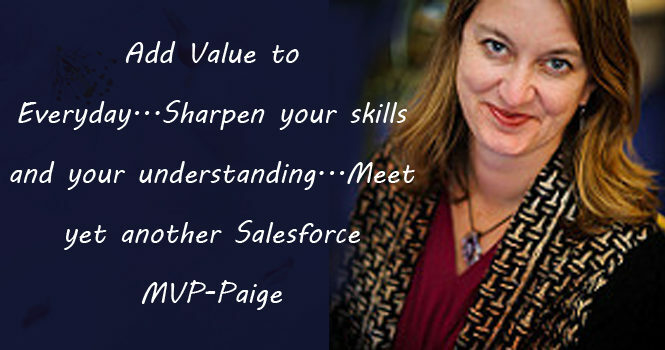 An MVP is truly a servant-leader to the Salesforce Community. We all give our time to the community because we want to help others to continue to grow in it. As an MVP, I have had a chance to attend more events and meet new people in the community that I would not otherwise have had the chance. It is really amazing the number of stories there is the community and how many shining lights there are to guide the Salesforce Community. How do you contribute to the Salesforce community? I started out co-leading Girl Develop It classes in my hometown of Chicago. As a result, I became more active in the Community and pushed myself to learn more. This led to me becoming a co-leader of the Women In Technology Salesforce User Group and co-organizer of the WIT Thirsty Thursday video conferences. WIT Thirsty Thursday is a chance for women to join via conference call and video and learn a new topic from where ever they are. Families and pets often make guest appearances! We don’t record the calls so we can make it as safe a space as possible to ask questions and be in the moment. I believe my biggest strength is my ability to relate to others and put myself in their shoes. I regularly draw on that strength when working with people to figure out what kind of an application to create to solve their business issues. It is a great feeling to know you helped someone to make their daily life easier and that they were listened to and own a part of that success. I struggle with work-life balance. I am coming to realize that most of us are in the same boat. As a mother of a tween daughter, I worry that I am modeling good balance so she can picture herself as a leader and all the other roles she wants in life. As I always look forward to sharing the experiences of Women in Salesforce, this time I decided to narrate the refreshing journey of Prajakta Samant. At the very onset, Prajakta started her career with a global consulting firm as a developer. She worked on numerous projects and developed an expertise in diversified languages namely C++, Unix, Java, and Oracle PL/SQL. However, even after working on it for 2 years, it didn’t intrigue her. She was more inclined to switch her project and was open to learn something innovative. “Don’t be afraid to ask for what you want. It is easy to allow insecurities about age/experience level to prevent you from making a big demand or asking for a meeting with an influential person. You might be surprised at what can happen if you just ask”. And Prajakta got that surprise when she asked to switch her project. She is thankful to her friend in her organization that she was onboarded on a Salesforce project. This was a turning point in her life. There was no one to assist her in the project but she accepted the intimidating challenge and grabbed the opportunity with both hands. After switching to Salesforce, Prajakta never felt the need to switch to another technology and this itself speaks volumes of how she feels in Salesforce. Being an amazing platform that is backed by its strong community Salesforce Ohana that Prajakta, Myself and many others are part of, it embraces everyone. There is a famous quote by Indra Nooyi that says “Women cannot have it all”. Prajakta feels that if you are working on Salesforce you can at least attempt to have it all – both personal fulfillment and professional success. And this is mainly because of the tremendous encouragement and support you receive every single day from the community. She is closely knit with WIT groups of Pune and Mumbai. Her achievements don’t end here she is the Director of “Women Who Code Network” for Pune. So, she wholeheartedly believes that more girls must enter the tech world and what better way than coming into Salesforce. She promises to work and hold many Salesforce certifications. “Be thankful for each new challenge because it will build your strength and character”. Challenges vary based on what phase of life one is, Prajakta’s current one is to balance the time she spends with her 2 year old daughter and her work because she loves both equally. Women no longer have an “if I can be in tech” mindset. Now it’s more about ‘how I can be in tech’. The shift is exciting! And it happened because we created a network of WIT where we show daily that women are innovating. Prajakta also loves sharing her knowledge in every way possible. She conducts speaker sessions at local meetups as well as community events. She has also conducted a webinar with Salesforce. Prajakta always find it a challenge to pick one person as inspiration because firstly based on circumstances her source of inspiration varies and secondly there are so many amazing women who are leading and involved in SALESFORCE OHANA! 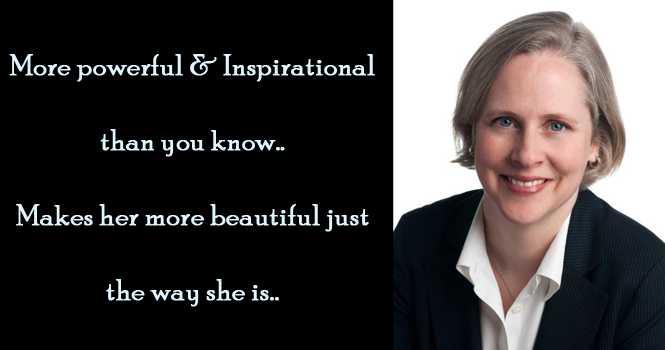 Apart from Salesforce, she is also inspired by some of the famous personalities namely Indra Nooyi and Ginni Rometty. Prajakta loves this quote by Taylor Swift that says, “it’s possible to climb to the top without stomping on other people”. So she thinks that let’s be kind to each other because we never know what battles other people are already fighting. With this encouraging note, I am ending one more inspiring journey of Prajakta Samant. Cheers to all women in Salesforce and the spirit of Salesforce Ohana. This time I am putting forth a story of Emily Hudson, one of the prominent personality in Salesforce. Emily started her full time career at Salesforce. She had a few internships at other firms, but as soon as she learned about Salesforce, (it’s culture, it’s products, and it’s philanthropic nature), she made it her objective to work in Salesforce. It was her “dream job” and she got lucky enough to end up in San Francisco at the incredible company- Salesforce! Emily stepped in her career as the Technical Evangelist in the AppExchange team. As a Technical Evangelist, she worked with ISV partners either building on or integrating with Salesforce’s platform. She had a territory of partners and she used to work with them as their technical consultant / technical account manager/solution engineer. She learned to code in that job and loved the idea of learning a new language that involved logic. After three years of that role, she migrated internally into her present Product Manager role and has been on the AppExchange product team ever since. Emily believes that Salesforce is a fantastic company to work for. They prioritize employee happiness with an emphasis on culture while pushing one to work hard and step outside your comfort zone at the same time. It’s a “work hard play hard” mentality which Emily absolutely love and thrive in. She says every individual is growing a lot but continuing to act like a startup by moving quickly, innovating, adopting cutting edge technology, and keeping up with the exciting ebbs and flows of the tech world. She thinks her weakness is her eagerness to fix an issue or complete a task, rather than taking a holistic view and prioritizing every issue and task against the others. Responding to every little issue results in longer working hours and less efficient use of time. She is working upon this as it is pertinent to her Product Management role and to keep up with the pace of the job. Emily is highly inspired by her mom. Emily’s mother, who is also an Engineer herself, encouraged and motivated her to pursue a technical degree and not letting the stereotypes get in the way. She even tries to emulate her mother in confidence at various corporate meetings. “You get in life what you have the courage to ask for.” According to me every girl must live her life believing in this. Emily is also an inspiration for girls who want to work in technology. She always loved mathematics and science, and never thought twice about being a female in that space. She wants other girls to approach it in a similar approach. “If you love STEM (Science, Technology, Engineering & Mathematics), pursue it!” Emily shares her college experience where she was one of the few girls in her engineering classes, but that didn’t stop her. She pursued what she loved. She wants to remove the stigma that girls aren’t as good at math, engineering and computer science. She thinks all this to be a bit crazy. Emily Hudson is 4x Salesforce certified (App Builder, Developer I and II, and Admins certifications) and is counting on more. Being a hard worker, critical thinker, and caring about the well being of others makes Emily the personality she is. She values relationships and genuinely cares about the people she works with, which helps her with team collaboration and allows her to empower others to do what they’re best at. It also helps her in leading her team, even if not from a direct management position. “Your only limit is you” with this optimistic note I am ending one more inspirational story that will undoubtedly embolden and stimulate the girls who want to exceed their career in Salesforce. Cheers to the spirit of Salesforce for promoting and bringing in forth all the females in technology. Let’s include more and more females and make them a part of Salesforce Ohana by helping them, assisting them and bringing young talent on board. Rebe’s Salesforce journey started as a Marketing Coordinator in a higher education non-profit near Chicago city. She started with this role having plans in mind to pursue her MA in Writing with the intent to design and teach English writing for Science/Math majors at an undergraduate level. After 2 months of her joining, the company had a customized professional edition launched by a local partner. The data migration went horribly wrong and she was provided with additional work along with her regular tasks, but the work intrigued her as she spent a lot of time figuring out how to clean Salesforce. Till now, she always considered technology as her hobby which gave her pleasure in her free time. She also thought that pursuing a career in Technology would require some degree or certification. But working as a Marketing Coordinator, she added new software skill set into her repertoire i.e. learning ETL(Extract Transfer Load) software, CRM Fusion Demand tools and more. Mastering that tool in addition to becoming a serious power user in Salesforce made her think she would look into pursuing a Master’s in Data Science. She even started applying to various Data Science programs but her curiosity with the Salesforce platform superseded her interests in Data Science. Rebe believes that She has no special talents. She is only passionately curious. 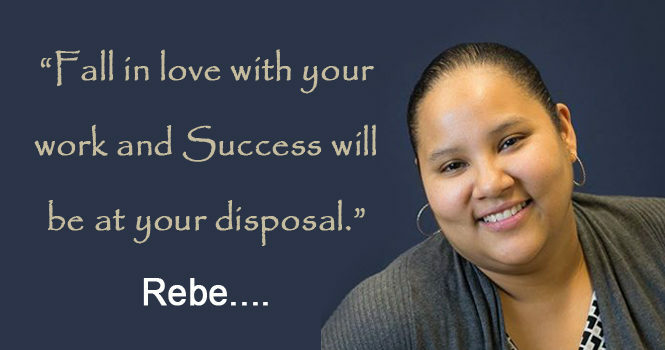 Rebe is 4X Salesforce certified and she plans to achieve more and more. From the day she first learned programming she aimed for the Salesforce MVP title and her hard work finally bore fruit. Rebe is always keen to learn new things that are coming in with respect to technology. This learning spirit of her and passion for diving in tech is what keeps her skills polished and refined. 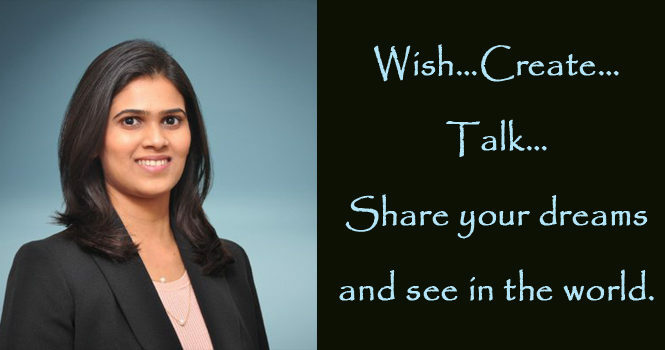 She says being in Salesforce is a blessing to be acknowledged as well as to receiving. Rebe is all set to educate people about Salesforce, Salesforce Community, Salesforce Ohana and giving back. Rebe is an excellent example a true leader and makes WIT (Women in Technology) in Salesforce proud with her achievements. Every time when I post a story on my blog it feels amazing to put forth the stories of females who are stepping high in shinning like a star. 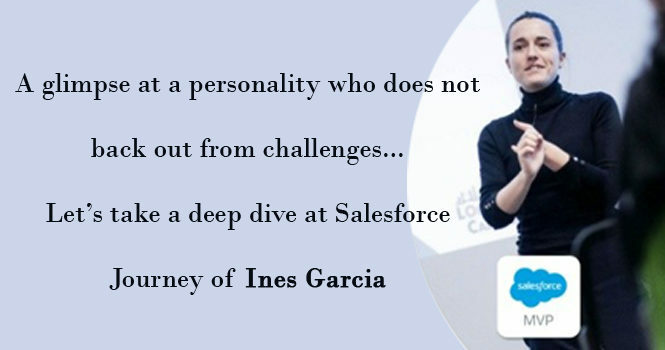 When I met Ines, my perception completely changed not only towards life but also for Salesforce. Ines from a very early age was encouraged to contribute in helping her family with daily chores like taking orders at her family shop, being on the counter and assisting in serving. It was her first job and since then she has been doing all sorts of jobs and that is why she is a strong believer of “Work is one piece of the puzzle for fulfillment” and has never been afraid to roll up her sleeves for any work. She was stimulated to step in Salesforce about 5 years ago when she was assisting a company with the CRM roadmap. Their CEO had experience of how powerful the Salesforce platform can be for the organization. Coming from more of a business transformation background, Ines enjoyed trying to figure out how things work and how can things be optimised for continuous improvement. Relatively quickly she was ‘playing’ in her free time with the Salesforce Fundamentals Workbook. It turned out to be so enlightening for her and soon she could build stuff which actually improved her efficiency, transparency, and collaboration for the business. She is also thankful to her Success Manager who introduced her to what is today the Trailblazer Community. It really inspired her in knowing the fact of how people help each other and the radiating positive energy this ecosystem possesses. She asked loads of questions in the answers section and that is why now she spends quite a bit of time there and in user groups now as it is her time to give back. Ines feels ecstatic to be working in Salesforce. As an organization Salesforce really lead by example from their 1-1-1 philanthropic model, Trailblazer Community to engage with fellow customers, Answers Community where users help each other, IdeaExchange so you can tell and vote on what new improvements one would like to have, supporting and promoting #EqualityForAll… and the list is endless. Thanks to programmes such as the MVP title which extends the positive impact of achievers to beyond their circle of influence. Ines feels in one way or another all can leave their ‘footprints on the sands of time’ and she believes it is everyone’s duty to do so. Ines’s aim is to inspire a future generation and she wants to lead by inclusion and equality in everything she does. She is currently an active collaborator leading Salesforce user groups, listed on the Answers Community leader board, running ad-hoc mentorships as well via The Mentorship Central, bringing the first Salesforce dreamin’ event to Spain as non-profit association (www.dreamole.es), and recently named as Salesforce MVP. She is of firm determination that if she can do this then anyone can, all you need is the drive, willingness to learn from others and get going. Ines’s achievement does not end here. She is 7 times Salesforce certified. Ines really enjoys learning, sometimes she is more indulged in the process than the outcome. One does not get surprised when they find out her Signature Themes from The Gallup Organization: Learner, Input, Individualization, Activator, and Intellection. Her constant flow of inspiration is her partner because of the endless support, drive, and care she gets. She also feels inspired looking at her Grandparents who are incredible, hardworking, kind, caring, proactive, always meaning well to each other and anyone else. Let’s incorporate one more motivating journey in my success stories which would serve as an inspiration to many. With every story, I feel motivated for bringing more and more women on board who have not only changed their lives but also serve as a lighted candle in someone else life. Paige is an amazing personality, full of life and great experience in non-profit management. She began her journey as international relations and East Asia Area Studies double major in college. After that, she spent a year studying in Japan. Her first couple of jobs after completing her studies were in Japanese travel enterprises. The fundamental challenge for her was that being a non-Japanese female, her career had constrained options. But her willingness to work more was greater and she joined Junior Chamber of Commerce as one of the board of directors where she realized her passion for non-profit work. The realization dawned on her and she was focused to work for a non-profit organization. Paige spent the next 20 years of her career working towards non-profit management for a variety of non-profits varying from an aquarium to free clinic. She never stopped, but continued to work and follow her dreams, which is why she has achieved so much. As a single mother, she is constantly juggled between all of the responsibilities in her life – work, managing a home, raising an active teenage boy. The flexibility she had in her job and working on a cloud-based platform really helped her. She could get work done on a mobile device while chauffeuring or flex her work time when she had parenting responsibilities. “When opportunity knocks at your door, always be willing to take a chance, because you never know how perfect something could turn out to be.” Paige was given a chance to work in implementing the technology plan; there were multiple databases in diverse systems namely Filemaker Pro, Excel and DonorPerfect. Although, she was not from the technical background but she supervised the entire implementation for new website and Salesforce as the CRM. She was an end user in the CRM system and implemented Salesforce 10 years ago. She witnessed her first Dreamforce and she was captivated by the endless capabilities which Salesforce offers. Salesforce has completely revolutionized the workflow of the organization she used to work with. Paige was so much impressed by the platform that she became the founder of the Los Angeles Non-profit User Group of which she is the co-leader now. The most remarkable thing about Salesforce which fascinated her is the vibrant, active and supportive community which revolves around the platform. It serves as a colossal benefit and part of what makes working with Salesforce so much fun and its endless rewards makes it all the more exciting. Salesforce is known for giving back and Paige is all the more involved in being as a volunteer for inclining young women in numerous technology platforms. She spent time with legendary Gillian Bruce and other renowned personalities who are involved in leading Salesforce project. She is currently three times Salesforce certified, TrailHead Ranger and has won over 200 TrailHead badges. The woman who herself is an inspiration for many is also inspired by women who are transforming the world for creating better opportunities for others. Sheryl Sandberg, Malala Yousafzai, Michelle Obama are some of the eminent personalities who have encouraged her in every facet of life be it supporting young girls in getting an education, how to face the negativity which comes in life with a strong determination which truly supported her in enlightening her path. Paige is best known for her management skills, work ethics, leadership qualities, coaching and supporting the people to walk on the footprints of how to work towards achieving success. Her wonderful trait of dealing with chaos with patience portrays her calm nature. Her success and the place which has reached now are totally owing to her hard work, determination to dream and achieve something big in life. Paige is truly grateful and appreciative to Salesforce platform for giving her the reward of being an MVP and to do good to the community. 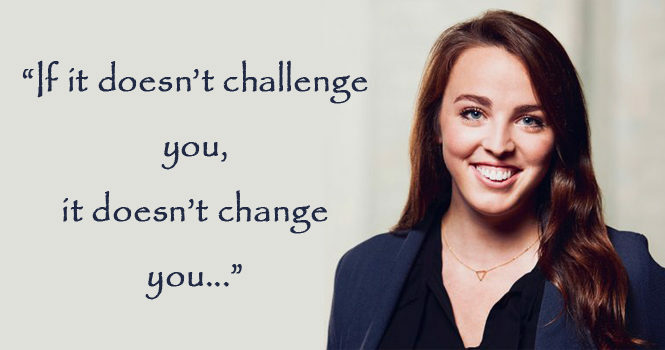 Let’s hear it for Paige and her rising will towards giving back to Salesforce. 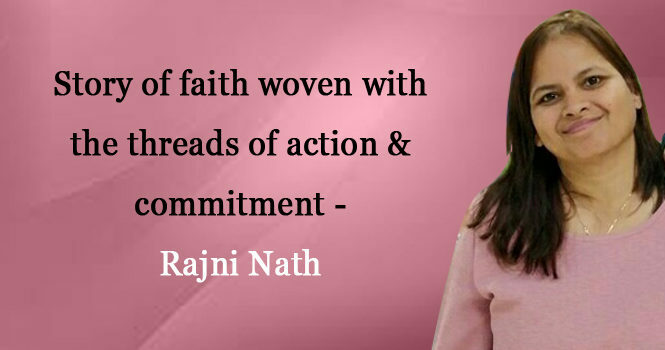 Life for Rajni has been a story of faith woven with the threads of action & commitment – a faith in the real virtues of life; at times to the extent of being shunned a dreamer! She has been one who would not generally fit into society approved molds easily and almost always end up choosing a path, less trodden on. Years later, and now a mother of two wonderful children aged 13 & 6, these still pointers still define her!! She still likes to live every day to her full potential, loving each role that she plays with full intensity and enjoys every bit of giving 100% to all areas, work, family & life! Born and brought up in parts of India where the concept of working women was a huge taboo during her growing up years, Rajni contributes her achievements to a visionary grandfather & very supportive parents. It was with their support that she had very rich childhood experiences which she feels have gone a long way in sculpting her overall personality. While in school, she would always make those small efforts to contribute to society through running literacy classes for adult women in her outhouse, campaigns for helping leprosy patients and collecting old clothes & books for giving away to those in need! Post Engineering (again a choice that not many women made back in the pre-2000 era! ), Rajni relocated to the National Capital Region of India. Started off as a Java Developer and moved on to become a project management professional post PMP certification. Constant learning, in order to keep widening the vistas of understanding, has always been a passion for her. She went on to complete her MBA after her first child and again an advanced Program in Strategy Management from Indian Institute of Management, Kolkata, one of the premier management institutes in the country, when her second child was just two! In 2015, it was a somewhat inadvertent entry into the Salesforce arena when she joined Girikon, a Salesforce Silver Partner, as the Head of Program Management & Pre-Sales. This is when she started reading voraciously on Salesforce related content, learning about the platform in depth& the different “Avatars” that it takes on, for different businesses. Thereon, it has been quite a journey! A journey of incessant learning – starting with the basic Sales & Service Clouds, to Community & Marketing Clouds; from very standard implementations to very complex custom developed systems on the platform & now to Lightning experiences & Al! While her work profile revolves around designing tailor fitted Salesforce Solutions &ensuring quality in the enterprise-wide Salesforce Implementations for her clients, Rajni summarizes her main contribution in having the opportunity to convince prospects that Salesforce is the right “Go-To” platform for their businesses thereby bridging those endpoint gaps for Salesforce to reach more and more medium and small level players as well! As a leader, she keeps motivating young Salesforce Developers and consultants to get themselves Salesforce certified. This, she believes triggers a chain of multi-dimensional value-addition – to individuals as professionals, to the knowledge base of the organization’ they belong to and eventually to the businesses that they serve! Rajni loves to engage with people in ways that are caring & empowering, trying to assist them in all possible ways towards nudging them to look for excellence in whatever they do. This is where the concept of the Salesforce “Ohana” impresses her a lot. She is a true believer in the powers of the real Feminine Energy and feels it’s time for workplaces to be nurtured by the feminine in a way that their very ambiances are full of life and happiness. 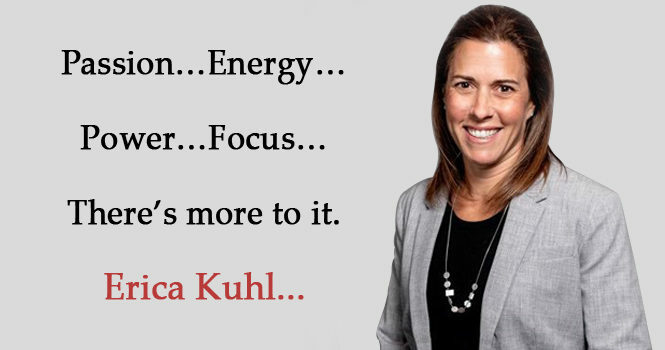 She promotes & keeps working towards improving the gender diversity in organizations that she works with. The dream workplace for her is one where there would be so much ease that there is no need left for people to strive so hard each day for a work-life balance! On a more personal level, she works with women who drop out of the workforce due to family obligations, to help them work out ways to return and be able to meaningfully pursue their careers without much pain & guilt. While Rajni plans to keep enjoying life, finding more quality time for family, friends & adventure sports, spreading the Salesforce “Ohana” spirit in her workplaces; what she looks at as her next milestone is to contribute to the extent possible in showcasing the young masses of today, the unlimited benefits of the practice of meditation. She believes this could be the next big thing enabling each human being to become his/her own alchemist, empowering one to transform long cherished desires into reality with utmost ease. 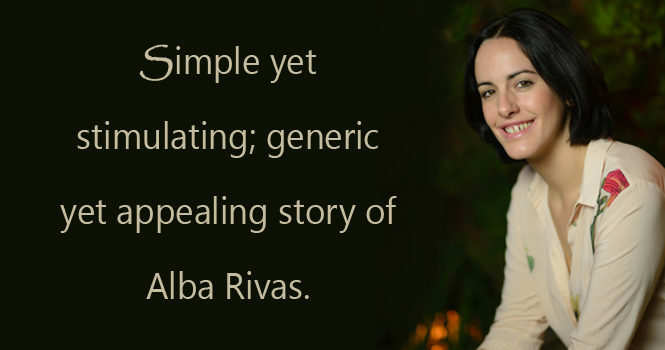 Simple yet stimulating; generic yet appealing story of Alba Rivas. The stories published before has given the idea to the audiences that how women are rising and are emerging as one of the leaders in every domain what so ever. I initiated this blog to enhance and promote “Women in Salesforce” and I am actually feeling amazing that one after another there are so many who inspire me to keep going and keep posting. So, here I am bringing one more new and fresh journey that will keep you up in high spirits. Alba studied telecommunications engineering in Granada’s university. She persuaded her post graduation in 5G mobile networks and then switched to software development. After working at an animation films company for 3 years she decided to specialize in web application development. She started her journey with Salesforce 4 years ago and discovered the unlimited potential in the field. Her journey may look like glazing the cake with cherry but it was not so effortless for her. She witnessed one of difficult challenge i.e. of the language barrier. Spanish people are not most famous for communicating in diverse languages, so having to work in English, blogging in English and presenting in English was something she dealt with and she has sweated a lot in doing that. Last year she organized dreamOlé, the Spanish community-led event, with other seven community leaders from Spain which gave her a lot of boosts. According to her organizing dreamOlé became one of the best experiences of her life. Due to the culture in Salesforce, she always feels supported, encouraged and boosted. “Salesforce Ohana” is not just for saying; it’s a support system where everyone in Salesforce is ready to support and motivate each other. 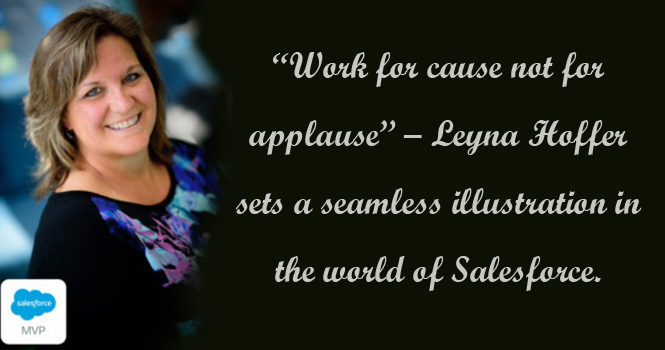 She believes this to be the greatest strength of Salesforce. She has been stimulated by a lot of renowned personalities in Salesforce. Some of them are Agustina Garcia, Andrew Fawcett and Carlina Ruiz. She has been guided by all of them at some point or the other and she has learned a lot from them both professionally and personally. Alba has taken assistance from many known personalities in Salesforce and seeing the helping nature of the Salesforce community has motivated her a lot. Now she just wants to give back, help others and blaze trails. And that’s simply incredible!!! Her first step towards it was when she started co-organizing the “Granada developer group” with Carolina. Then, she got involved in numerous knowledge sharing initiatives namely RAD women, Developer Forums, Salesforce Events. After a while, she also decided to start her own development blog to spread the word! Ever since she came in Salesforce she was aiming to become “MVP” in Salesforce and now she has achieved that. She believes that some of the initiatives she took are part of what the community saw in her for nominating her as an MVP, for which she feels very indebted and grateful. Alba is quite a proactive person who is willing to learn, help and those are ingredients that work very well in the Salesforce Ohana family. Alba also feels that women are especially cared for in the Salesforce ecosystem. People are aware of some unfair situations that women face on a daily basis, some of them related to gender, and they try to remedy these situations. Alba herself has coached twice a group called RAD (Radical-Apex-Developers) women, which gives Salesforce development lessons to women for free, and there are many other initiatives where Salesforce leaders participate to educate and make more women inclined towards technology. She attained certification of the App Builder which she found out to be very interesting. She intends not to limit to just one certification and is aiming to pursue more certification in the times to come. Although, she has come across with millions of failure but her philosophy is to encourage and focus are the two elements which keep her going always. She believes in the dictum “Do your best, and assume that people do their best”. That way, failures will be insignificant. With this I am ending one more amazing journey towards Salesforce. Cheers to the spirit of Salesforce Ohana and Cheers to Alba Rivas!! !